Google is busy with its quest to take over the world. Or at least photograph it for others to experience from the convenience of their computer. Thanks to that quest to capture every corner of the Earth in first-person, you can now experience the Iditarod dog-sledding endurance race through Google Street View. The Iditarod, or self-labeled “Last Great Race On Earth,” is a dog-sledding endurance race that covers over 1,000 miles between the Alaskan towns of Anchorage and Nome, and you can now experience the cold, exhausting expedition on your computer with the help of Google. 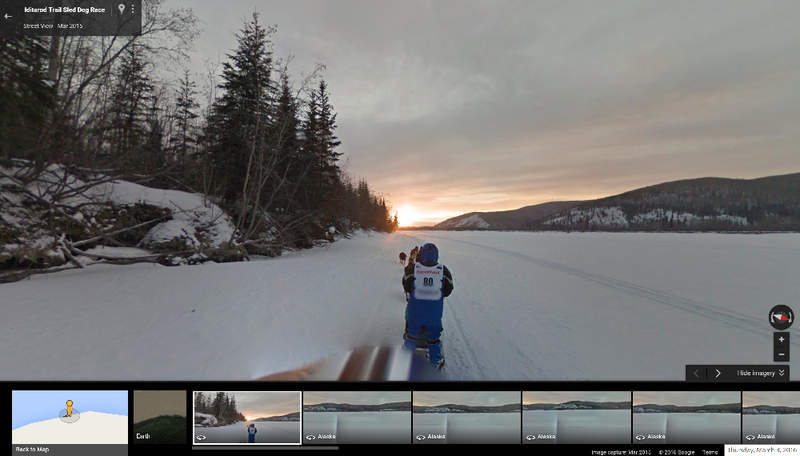 You can check out the journey on Google’s special Iditarod website, with tagged way-points and some cool first-person imagery. According to TechCrunch, Google developed a Street View trekker to attach to John Bailey, who rode a sled behind sledder Dean Osmar, who won the 1984 Iditarod. Osmar and Bailey’s journey ran into issues with the weather, causing the race to start in Fairbanks instead of the traditional starting location in Anchorage. Osmar also fell down a few times wearing the trekker, resulting in some classically hilarious Street View images. We’re pretty sure this person is not dead. In the future we don’t make movies about great journeys—we just Street View them at our own convenience.